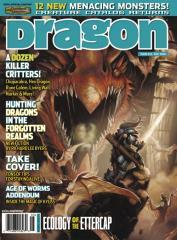 #343 "Creature Catalog #5, Hunting Dragons in the Forgotten Realms"
by Wolfgang Baur, Sean K Reynolds, et al. The Creature Catalog returns with twelve new monsters. From classic creatures like the norker to new terrors such as the hex dragon, these critters are hungry for the taste of adventurers. Here is just a taste of the creatures lurking within. Spd 40 ft. (8 squares), fly 100 ft. (good), burrow 40 ft. Breath Weapon (Su): 100 ft. line, contact poison, Fortitude DC 25, initial and secondary damage 1d10 Con. A new Forgotten Realms short story about betrayal, trust, and hunting dragons. Rumbling up from below and swooping down from the skies, monsters have always had the edge when it comes to mobility, but not anymore. Learn the tricks to turn their edge against them. Here is an excerpt. For incorporeal foes, the material world only exists when they want it to. Free to lurk inside solid objects, they can emerge when you least expect it, laughing at your futile sword thrusts even as their own attacks effortlessly pass through even the thickest armor. Gifted with this near invulnerability, their capacity to cause harm seems matched only by their malice. You are connected to the intangible threads of existence that lie beyond the Material Plane. Benefit: Something about you makes it difficult for incorporeal creatures to see you clearly. When on the Material Plane, you have concealment from incorporeal creatures (20% miss chance). See invisibility does not counteract this effect, but true seeing does. An incorporeal creature that cannot see the subject ignores this effect (although fighting an unseen opponent carries penalties of its own; see page 151 of the Player's Handbook). This feat has no effect on corporeal or ethereal creatures. The Ecology of the Ettercap, Spells of Kyuss, Class Acts, First Watch, Sage Advice, Scale Mail, Wormfood, comics, and more!